You’ll have worked with good business contacts, the bad, the scared of networking and the confident, but we've found the most successful business and sales people have the ability to build instant rapport with the person in front of them. They engage rather than slavishly following learnt "sales patter"! The workshop will help you to engage and establish rapport. We'll look at written material that engages some and turns others right off. By the end of the session you’ll know your communication style and soon see why some customers or colleagues come naturally to you and with others you have to work a little harder. In a way your target market will see and hear, but most importantly connect. To attract the clients or customers who get you and you understand. So that you can reach the broadest range of client group by mixing visuals, credibility and detail. Your clients, manager, team listen. You can influence and impact on those who matter. You can attract the right clients. Your social media, content, and websites maximise impact for a varied audience. Coaches you'll understand communication cues that will help you to challenge your clients effectively. 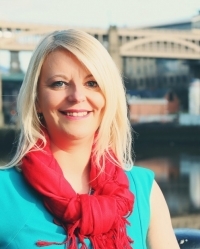 Beverly Sherratt is a coach, mentor and communication/behaviour specialist. She is CIPD qualified, is an NLP coach, DISC profiling practitioner and licensed trainer. She is also an i3 Associate and co-facilitator. In a nutshell she loves all things behaviour and communication! Beverly works with people and organisations to help them get unstuck!